The stream bluet (Enallagma exsulans) is a species of American bluet damselflies in the family Coenagrionidae. Its length is 29–37 mm. Many bluet species prefer ponds and lakes; the stream bluet as its name implies is most at home along moving waters. It can be found along small to medium-sized rivers. It is occasionally found at lakes too. 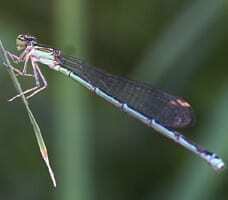 In many species of damselflies the males have a blue tip to the abdomen. Enallagma exsulans is one of those less common cases where the female, too, has a blue abdominal tip. Summertime is the best time to look for stream bluets.